With a victory, Netanyahu would capture a fourth consecutive term and fifth overall, which this summer will make him Israel’s longest-ever serving leader. Re-election will give him an important boost as he braces for the likelihood of criminal charges in a series of corruption scandals. The election outcome affirmed Israel’s continued tilt to the right and further dimmed hopes of a negotiated solution to the Israeli-Palestinian conflict. In the final stretch of the campaign, Netanyahu had for the first time pledged to annex parts of the occupied West Bank in a desperate bid to rally his right-wing base. Annexation would snuff out the last flicker of hope for Palestinian statehood. 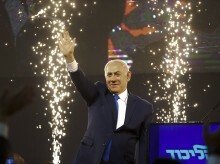 Both Netanyahu and his challenger, former military chief Benny Gantz, leader of the rival Blue and White party, had declared victory in speeches to boisterous gatherings of supporters. But as the night went on, there were growing signs that Netanyahu’s Likud was pulling ahead. But the corruption scandals created some voter fatigue. Along with two other former military chiefs on his ticket, Gantz was able to challenge Netanyahu on security issues, normally the prime minister’s strong suit, while also taking aim at the prime minister’s alleged ethical lapses. Israel’s attorney general has recommended charging Netanyahu with bribery, breach of trust and fraud. The telegenic Gantz, who has been vague on key policy issues, has presented himself as a clean, scandal-free alternative to Netanyahu. By Wednesday morning, with 97 percent of the votes counted, Likud and Blue and White had won 35 seats each. But Netanyahu was in a stronger position to form a coalition government with the anticipated support of right-wing and ultra-Orthodox Jewish parties, Likud’s natural allies. Earlier in the night, with fewer of the votes counted, Blue and White still appeared to be ahead by one seat and Gantz projected optimism. “Elections have losers and elections have winners. And we are the winners,” Gantz told a victory rally shortly after midnight. His attacks on the Arab sector fueled calls for a boycott and appeared to result in relatively low turnout by Arab voters. Israel’s central elections commission banned parties from bringing cameras into polling stations after Likud party activists were caught with hidden cameras in Arab towns. “They want their occupation to be endless,” he said.